While you can buy a $500 iPad at Amazon.com with a single click, sending even small amounts of cash to a friend or relative is still often a tedious and slow task. In most cases, you wind up doing exactly what you would have in 1957 — writing a check and mailing it. The recipient then has to cash it or deposit it in her bank account. An app, available for Apple and Android devices, lets you enter an amount and create email to send. But starting Tuesday, you can just email cash, free of charge, directly from your debit card to anyone else’s, regardless of what bank each party uses. There’s no login or password to remember and no special software or hardware required — you just use email. It works on both ends using any email service or program on any email-capable device, whether a computer, a smartphone or a tablet. This new service, called Square Cash, comes from Square Inc., best known for equipping small brick-and-mortar merchants with smartphone-swiping devices that allow them to accept credit cards, and with tablets that act as sophisticated cash registers. Square Cash permits you to send up to $2,500 a week in several transactions or all at once. At launch, it works only in the U.S., and with debit cards carrying either the Visa or MasterCard logo. It isn’t meant for buying things from merchants, online or off, only for person-to-person cash transfers. There are other services that allow you to send money from one person to another digitally. You can do it via PayPal, or via a newer service called Venmo, which PayPal is in the process of acquiring. But I believe Square is simpler and more private. For instance, PayPal places received money in a PayPal account and you must transfer it to your bank in a separate step. Venmo has a strong social component that encourages users to post when payments are made. I tested Square Cash, sending and receiving money in amounts ranging from $10 to over $1,000, with eight people, and it worked rapidly and flawlessly. I can recommend it for anyone who needs to pay a small debt, give a cash gift, split a bill, or send cash quickly and easily. I sent several $5, $10 and $25 amounts, and asked for and received, all or part of the money back, in order to test receiving money. I also used Square Cash to settle a real bill, with a friend, to pay my half of a shared $2,223.76 fee she had covered. It worked fine in every case. 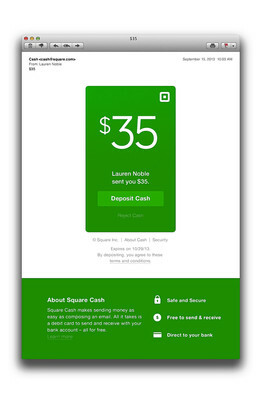 An email sends cash via Square Cash, where the money will be available in the recipient’s bank account within one to two days. There is one big caveat: You have to trust Square. The company has a strong track record in its merchant business, so it isn’t brand new to the money-transfer business. And Square says it has strong security measures and close human and machine monitoring for possible fraud. If fraud is suspected, the company says it can and will reverse the fund transfer. 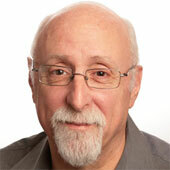 Still, digital services do get hacked, and email can be manipulated by thieves. The service notifies you via email or text that it appears you have sent money, which gives you a chance to cancel a transaction that didn’t come from you or was a mistake. So, if you don’t trust Square to defeat such things, you shouldn’t use Square Cash. Here’s how Square Cash works. Say you want to send $47.12 to your sister. You just compose an email with her email address in the “To” field and, in the “CC” field, you enter “cash@square.com.” In the subject field, you enter the amount you’re sending — in this case, “$47.12.” You can leave the message body blank, or add a note explaining you’re sending the money and why. Then, you just press Send. If this is your first time using the service, Square will email you a link to its service, where you’ll be asked to enter your debit-card information. This is required one time only. Your sister will receive two emails: The one from you and a second from Square saying you’re sending her the money. If she accepts the payment and it’s her first time using the service, she will be asked to click a link to Square and enter her debit-card information. Once that’s verified, the transfer is made, and the money will show up in her bank account in one to two days. She will also be empowered to send money herself. No other account setup is required. You never need to create, or enter, a login or password. And the money goes straight from bank to bank. Neither party needs to create a fund balance with Square. 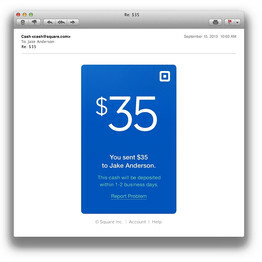 Square says most payments appear in the recipient’s account in one day. And it says a significant minority of payments appear immediately, something it hopes to make commonplace as soon as possible. There’s one more twist, however. This simple verification system works only for transfers of up to $250 a week. To qualify for the full $2,500 limit — which is also free — you have to provide some added information, one time only. You can give Square your Facebook credentials, or provide your full name, date of birth, and the last four digits of your Social Security number. The email on the receiving end. If you choose the Facebook option, Square says it passes no information to Facebook at all and never posts what you’re doing on Facebook, or shares your financial activity. It says it merely looks at your Facebook profile and activity, as a Facebook friend could, in order to verify that you are a real person, with an established account there. 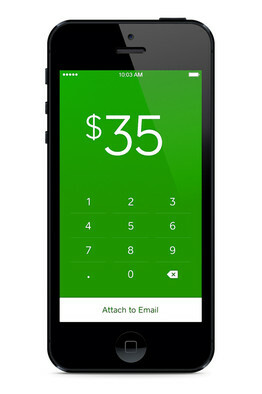 Square Cash does have apps for Apple and Android mobile devices, but you never need to use them. All they do is let you enter an amount you wish to transfer and automatically create an email, ready to send. So how does Square make money from Square Cash? It says it has no plans to send you ads or offers, even for merchants with whom it does business. Instead, it plans to offer paid, premium options. One example: The ability to use Square Cash internationally.